The Atlantis Ring and its symbol are empowerment tools that help protect, balance and harmonize a person’s energy field. Its beneficial energetic properties help shield the aura and minimize the effect of harmful frequencies. It helps circulate and distribute healing energy throughout the body and the subtle energy field of a person. 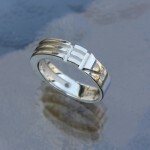 The Atlantis Ring also increases the ability to tap into one’s intuitive powers, the subconscious and the soul. You will notice an increase in synchronicity as well as a much higher level of intuition after wearing this ring for some time. These are some of the reasons why this powerful ring has been worn for hundreds of years and is known all over the world. The Atlantis ring is also called Luxor Ring, Atlantean Ring or Egyptian Ring. 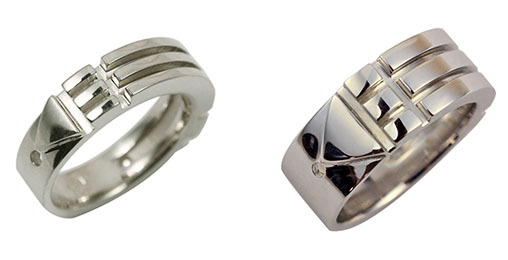 The efficiency of this ring is due to the waves of Luxor, whose invisible agents catalyze cosmic energy. This is explained further in other sections of this website. 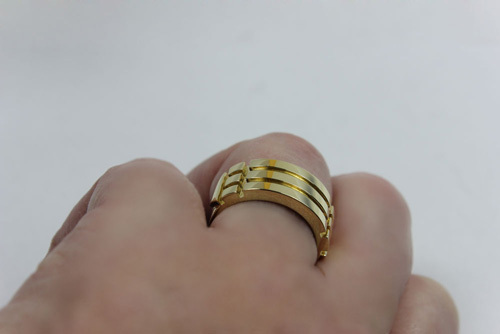 The ring in its effective design utilizes the Luxor symbol, widely used in radiesthesia, which is composed of two isosceles triangles, three long lines and six short lines. For 3D versions of this symbol, two holes and a straight groove uniting them are added to assist the energy flow. The design follows a specific measurement based on Sacred Geometry proportions (the Golden Mean) and its benefits will be felt mostly in the three areas mentioned above: Protection, Healing (energy balancing) and Intuition. What is the origin of the Atlantis ring? André de Belizal was a well-known expert in Radiesthesia, the science concerned with the energy of shapes and other subtle energy qualities. He built several radiesthesic instruments over time such as specialized pendulums and devices to test or harmonize the energies of a person or dwelling. He wrote several books on the subject such as “Essai de radiesthésie vibratoire” and is well respected to this date, having left an amazing legacy in documented experiments, devices, scientific and empiric research. De Belizal investigated and found that this ring’s geometric shapes created a subtle energy field of powerful vibrations. He found that its energetic quality, which he called “Waves of Luxor” prevented the alteration of energy patterns, resulting in a protective shield for whoever wore it. It also increased intuitive powers and helped develop telepathic and psychic abilities. He studied and tested the patterns on the ring carefully to find the amazing and magical properties of the Luxor symbol, which were then applied to other instruments and tools for harmonization and balancing of places and energies. The Atlantis Ring design is based on the principles of Sacred Geometry and contain multiple occurrences of the golden mean, or Divine proportion. The golden mean ratio is featured in the golden spiral, which is an infinite, forever spiral. It has no beginning and no end. Sacred Geometry involves sacred universal patterns used in the design of everything in our reality, often seen in architecture and art and also found in Nature. Sacred geometry and mathematical ratios, harmonics and proportion are also found in music, light and cosmology. It is considered foundational to building sacred structures such as temples, mosques, megaliths, monuments and churches. Sacred geometry may be understood as a world view of pattern recognition, a complex system of symbols and structures involving space, time and form. By studying the nature of these patterns, forms and relationships and their connections, insight may be gained into the mysteries of the Universe. Many forms observed in nature can be related to geometry (for sound reasons of resource optimization). For example, the chambered nautilus grows at a constant rate and so its shell forms a logarithmic spiral to accommodate that growth without changing shape. Also, honeybees construct hexagonal cells to hold their honey. These and other correspondences are seen by believers in sacred geometry to be further proof of the cosmic significance of geometric forms. The golden mean ratio, which is equal to approximately 1.618, can be found in various aspects of our life, including biology, architecture, and the arts. Some call it “God’s blueprint”. One more interesting finding about the golden ratio is what is described in the research of Dan Winter about of the harmonics of the heart. According to his studies, when an individual is relaxed and receptive and feeling love, the average distance between frequency peaks (heartbeats) recorded on a special machine was 1.618. This number represents the golden mean ratio. Also, when two individuals were hooked to the machine and they sent love to each other, their waves and peaks lined up at 1.618 — and so they were, in essence, two hearts beating as one, into Infinity. So, when two people are sharing the emotion of deep, reciprocal love, the average space between their hearts’ electrical waves is 1.618, the golden proportion–which is, literally, Eternal Love. The Atlantis ring construction follows the Sacred Geometry principles of the Golden Mean for the alignment of its design elements, proportions and angles. Healing (energetic): the second property of the ring is that of healing, not necessarily the physical lesions and trouble, but to re-establish certain energetic functions accidentally disturbed and suppress their subsequent effects. Intuition: the third property is the most mysterious; The one who wears the ring becomes sensitive to certain communications that he/she would never have been aware of . It increases one’s intuition and ability to connect with higher levels of consciousness and Spirit guides. The Book “Ces maisons qui tuent” (Houses that Kill) describes a series of locations and events that affected people’s energy in a detrimental way in the 1950’s and it mentions tools and special devices that were effective in the protection and transmutation of these harmful frequencies. The author, when describing the Atlantis ring, mentions the story of Howard Carter, the archaeologist who survived the “curse of the Tutankhamon mummy” whose tomb was discovered in 1922. At the entrance of the tomb, there was an ominous inscription that threatened those who dared to disturb the Pharaoh’s eternal sleep. The first to succumb to the ‘curse’ was Howard Carter’s partner Lord Carnarvon, who died suddenly soon after the discovery from an inexplicable cause. Within a short 2 year period, the list of those touched by a similar and mysterious deadly fate included over 18 names. The author states that Howard Carter was the only person not affected by this chain of events and according to the book, the reason was his protective amulet, the Atlantis ring. Only legitimate historical evidence could confirm the accuracy of this intriguing story. Nevertheless, Lafforest was himself a great believer in the exceptional properties of the Luxor symbol/ring which he got to know well through his personal relationship with Belizal. He also mentions the Atlantis ring and its beneficial qualities in his book “La Magie de Énergies”. Is it true that the Atlantis ring will protect me? Wearing the ring doesn’t mean that someone is protected from their own reckless or irresponsible behaviour. The law of cause and effect and the laws of karma still apply. It will help to keep you clear of negativity and energetic toxicity from people and places that sometimes attach to one’s energy field and start attracting all sorts of ill fate. It should also help minimize the effects of telluric currents. A telluric current – from Latin tellus, “earth”, or Earth current, is an electric current which moves underground or through the sea. “Telluric currents result from both natural causes and human activity, and the discrete currents interact in a complex pattern. The currents are extremely low frequency and travel over large areas at or near the surface of the Earth). The Cosmo-telluric balance is influenced by the Sun, the Moon, the Solstices, the equinoxes, volcanic eruptions, earthquakes, eclipse, alignments of the planets, and the passing of comets. Our work places or homes can be disturbed by geological faults, underground rivers and underground gases like radon, by radioactivity and high voltage overhead power lines. A geopathical zone can bring a rupture of the Cosmo-telluric balance and generate harmful waves. The people living in these disturbed zones can become sick because of their environment” (Source: Wikipedia // Adolphe Landspurg Geobiologist). The Atlantis ring has been part of my life for 30 years now. I have a strong connection with its symbolism and energy. My decision to make it part of my jewelry creations is a sincere testimonial from someone who has a strong belief in the benefits of this ring. 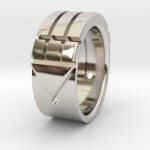 For several years, I received incredible feedback from clients and friends who wore the Atlantis ring. In many cases, they have managed to bring a whole new perspective to their lives, just by feeling more empowered and connected with their ability to see more clearly and use their intuition. The ring helped activate their potential, undisturbed by negative influences, and acted as a catalyst for their personal transformation. I have been making the Atlantis ring for a decade now. I created my first ring by modelling it in wax, inspired by the original ring. A few years ago I re-created a very powerful model in a 3D CAD environment that allowed for precision of the Sacred Geometry measurements and proportions on the ring which have been tested and proven to vibrate very high frequencies that are beneficial for harmonizing and balancing the human psychological, emotional and energetic field. The original ring, made of clay belongs to the French family of Andre de Belizal. 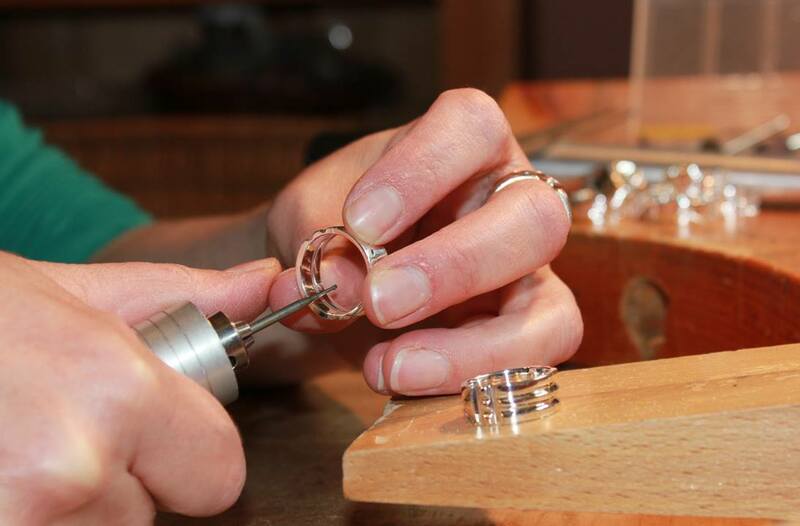 All other rings in the market are either attempted reproductions or creative designs based on the ring. 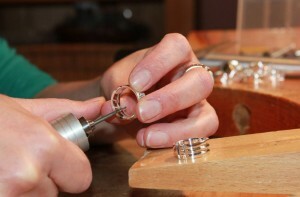 The rings I make are not reproductions of the original ring. These rings are my own designs that contain the representation of the Luxor symbol found on the original Atlantis ring. I am myself an intuitive dowser, energy worker and Reiki practitioner and make these rings with the serious intent to spread positive energy to help empower the healer within. If requested, I will add your personal intention when preparing the ring. I am a Reiki Master and can infuse your positive intention into the energy of the ring in the form of a Reiki blessing. 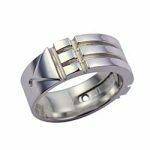 This is not needed or required, but creates a beautiful psychological and spiritual connection with your Atlantis ring. The Atlantis rings you see on this website are made individually with high quality materials, hand finished by me with love and personal attention to each piece. They are not mass produced for profit.